The outdoor paddling season is far from over. We'll still be on the lake for another month or so (and, we hope, the annual New Year's Day paddle on the Chicago River). 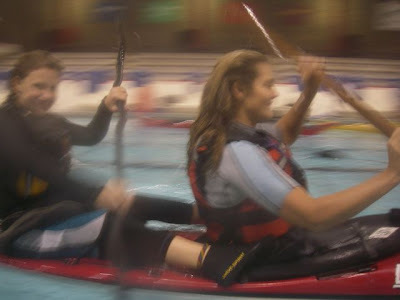 But the indoor paddling season has begun. It's a delightful period of overlap, when we can paddle in water that's 70 degrees one day and 50 degrees the next. Dave Olson (left) visits with paddlers at the UIC open pool session. 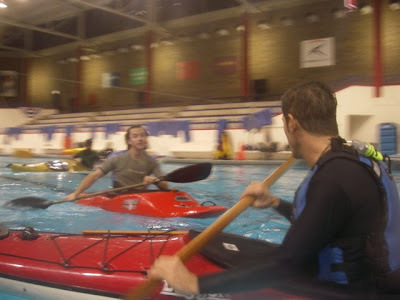 Wednesday nights are open pool sessions at the University of Illinois at Chicago, thanks to Dave Olson of Kayak Chicago. Dave rents the pool for 40+ weeks and welcomes paddlers to pay by the night or by the season to use it. He also rents boats for those who arrange it in advance, and he offers lessons. We mainly come to work on skills and enjoy weekly time on the water in the dead of winter. This past Wednesday was the first pool session of 2008/09, and most people just seemed happy to see one another again. Wendy Madgwick and Hannah turn a single into a double. Alec demonstrates a C-to-C roll.